Detail : Paul's thirty-fifth single. 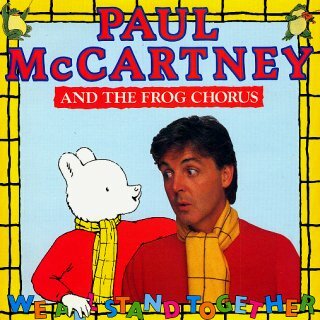 Credited to "Paul McCartney and the Frog Chorus". Taken from the animated featurette "Rupert and the Frog Song", this was only released in Britain. Rupert the Bear had been a childhood favourite of the young Macca, and once he had bought the rights to Rupert, Paul set about making a film and supplying the music to it. In 1979 Paul made an entire album of songs for a full-length animation film to be made by Oscar Grillo. 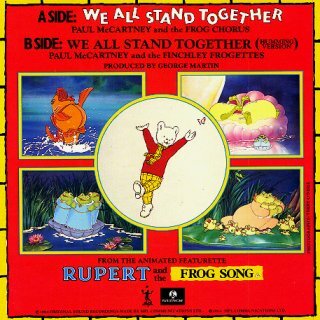 The film was never made, but eventually "We All Stand Together" was used in the short cartoon. On 13th March 1985 at the Ivor Novello Awards, Paul is awarded with "Best Film Theme of 1984" for this track. The same formats were released again a year later to attempt another Christmas market sales push, but this went by un-noticed. The single was released in a picture sleeve, with photography by Terry O'Neill, and a few weeks after it's initial release, a "cut-to-shape" picture disc single.